The Jenzano Heavy Duty Press Welder is a versatile machine that serves as either a spot or projection welder. 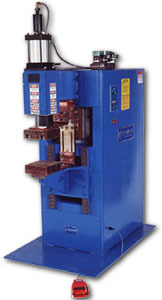 With adjustable controls and reconfigurable options, this machine can adapt to your current and future needs. Throat Height (between platens): 6" - 20"
Dimensions (HWD): 99" x 40" x 60"